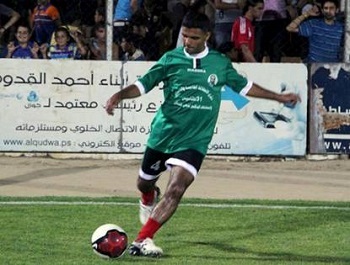 Mahmoud Sarsak is a 26 year old soccer player who was a member of the Palestinian national team before being imprisoned by the Israeli authorities in 2009 without charge. He was only released in July 2012 after he went on a hunger strike which lasted 3 months. He will talk about his experiences and in particular the time of his illegal detention by the Israeli authorities. After nearly three years of detention without charge or trial, and as part of a growing movement among Palestinian political prisoners, Mahmoud launched a hunger strike on 19 March 2012 in protest against the latest extension of his detention. He was then held in solitary confinement at Eshel prison until his transfer to Ramleh prison medical center on 16 April as a result of his deteriorating health. He was finally released to Gaza after 90 days on hunger strike. Mahmoud is currently on a speaking tour of the UK and lending his support to Kick Israeli Racism out of UEFA 's campaign against the UEFA U21 finals being held in Israel that was marked by a protest outside Grosvenor House on May 24th.